When original singer Darren White left the band in 1995, guitarist Vincent Cavanaugh stepped up to the mic and by the time their next album came out in 1996, a new sound was clearly forming. With ‘We’re Here Because We’re Here’ – the band’s eighth studio long-play and first in seven long years – the band has really nailed their atmospheric rock vibe. While some people have likened the modern Anathema experience to Pink Floyd and Radiohead; they’re really their own beast. While the music may have changed, lyrically they still sing of darkness, depression and desperation – apparently attracting their fair share of high-profile fans. Ville Valo from HIM makes an appearance on the moody ‘Angels Walk Among Us’ and the album was mixed by the brilliant Steven Wilson from prog masters Porcupine Tree. It’s a wonderfully layered, ethereal experience that is as equally uplifting as it is darkly moving. There’s an incredible space in the mix that lets the listener virtually immerse themselves in the music – something very few bands seem to be able to achieve. 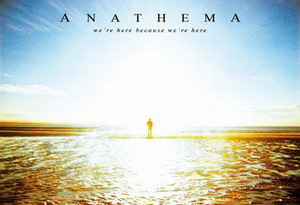 Tracks like ‘A Simple Mistake’ and ‘Get Off Get Out’ display Anathema’s enduring ability to combine light and shade; with brilliant, sparkling crescendos building up slowly from almost inaudible, delicate beginnings – only to end each musical journey with a delicate close. This is definitely a must-buy for 2010!